One of the top singing birds is the canary, a bird that has been known for many centuries for the beautiful song it sings. These pets are small, and do not require much attention as long as there are several of them together. Singing canary birds can be perfect for apartments and small spaces, and their song will bring a lot of joy into your life when you have these birds as pets. The goldfinch is one of the top singing birds, and this family is also beautiful to look at and watch. The brightly colored males and the dull females both have a song that is enchanting, and can brighten any home. Finding goldfinches for sale is easy, because most pet stores carry these birds, and they are very affordable. Cute little parakeet or a budgie bird is considered to be one of the exotic pet birds, this pet is a very popular choice for bird lovers all around the world. Parakeets are small and do not require much room, and if you have several in the same cage they do not require any attention or social interaction from you. 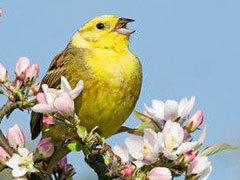 The song of this bird is melodious and sweet, and will quickly captivate you. A cockatiel is one of the top singing birds, and this pet is larger than a finch or canary. This bird has a crest which will stand up when the bird is excited or frightened, and they are a small parrot so they are more amiable to being held than many other birds. Cockatiels can talk and sing if trained to do so, and they have a beautiful voice that you will love. One of the top five singing birds is the African Grey parrot. This is a medium to large sized exotic bird, and you will pay a lot more for this pet than you will for canary birds for sale. This pet will also require a lot of time and attention, and will need a much larger cage and space. Some of these birds can say more than two thousand human language words for a very impressive vocabulary, and when they sing it will get attention.